Liverpool 1957, what a civilised place. 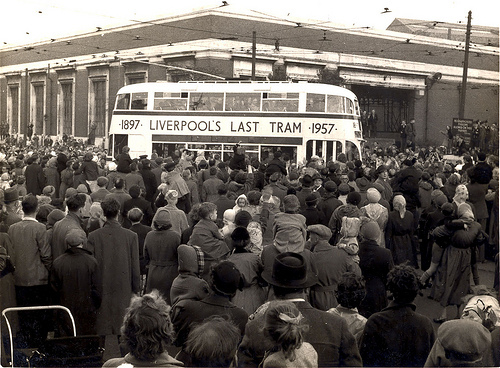 But we haven’t had trams in Liverpool for most of my life because by 1957 their time here was up. My Mum always called them ‘boneshakers’ and thought buses were much better. Most people, including the City Council seemed to agree with her. This being a time, I’d later see, when being ‘old’ was in itself enough justification for a thing to be cleared. Leaving Edge Lane depot on the last day. So, here we are. It’s 14th September 1957 and I am 3 years old. Me and my Dad are sat in the upstairs window of Clark’s Shoe Shop in Lord Street. Our vantage point to see Liverpool’s Last Tram progress down the street, before being taken along to the Docks to be exported to a museum in America. September 14th !957, the Last Tram on Lord Street, passing Clark’s Shoe Shop, where I’m sat watching it. 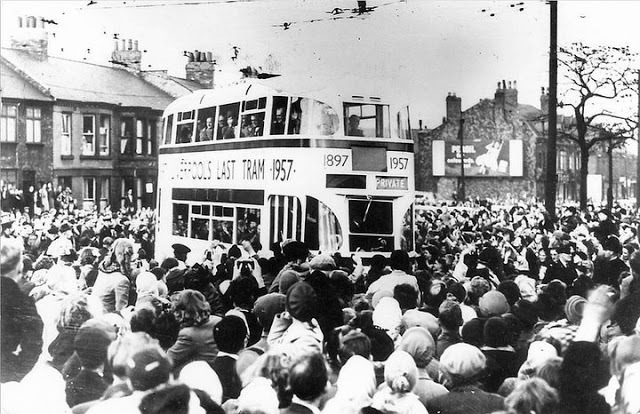 It comes into sight, at the head of a parade of other trams, this ‘Last Tram’ all painted creamy white like it’s a party, crowds cheering, most seeming glad to see it go. Not me. 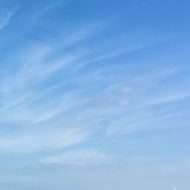 I don’t think I cry but I remember being sad and thinking, for the first time in my life, that what nearly everybody else thinks is wrong. I love the trams and I know I am going to miss them. I don’t know, of course, that the middle of Liverpool is currently being ‘planned’ by ‘Town Planners’ with a new ring-road system for the buses and cars and walkways in the sky to keep people out of their way. And so trams that run in dedicated tramways don’t fit with this vision of a new motor-dominated city. Yes we did have that, and yes we did scrap it all. And yes it still beggars belief. How great it would be now to have a tram network linking up the whole city to the waterfront Overhead. It’s like imagining a parallel world where the short-sighted politicians and planners of the 50s and 60s didn’t botch up my city. 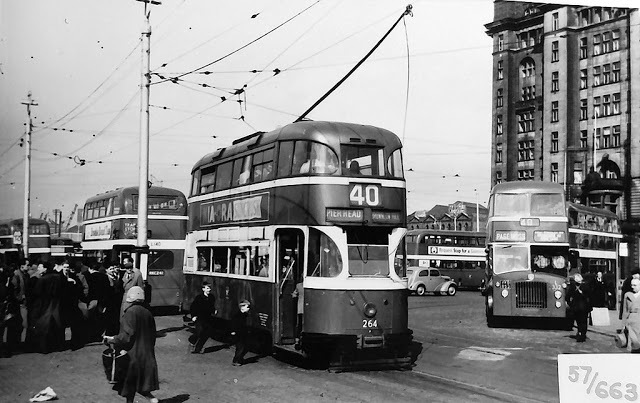 Into London Road from Lime Street in the 1950s. But there we are. The first great historic event at which I’m present and it’s a sad one. But I was there and I knew it was wrong at the time. Gearing up for an opinionated life. And here are the films I found. Gorgeous ‘No Trams to Liverpool’ pieces by Alf Jacobs about the trams and the Overhead, made when he knew they were going. I salute you Alf and would have got out my film camera and helped you, except I was only 3 years old. The films are long, but even a brief flick through will show you what we destroyed, what we could have still had. 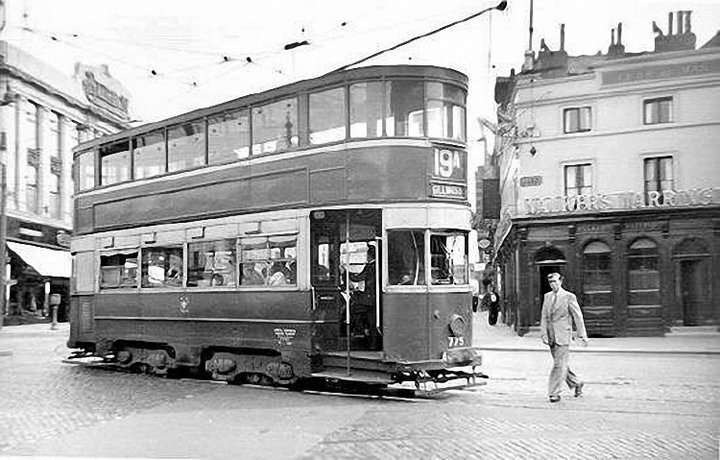 And a final tram picture just down the road from where we live. 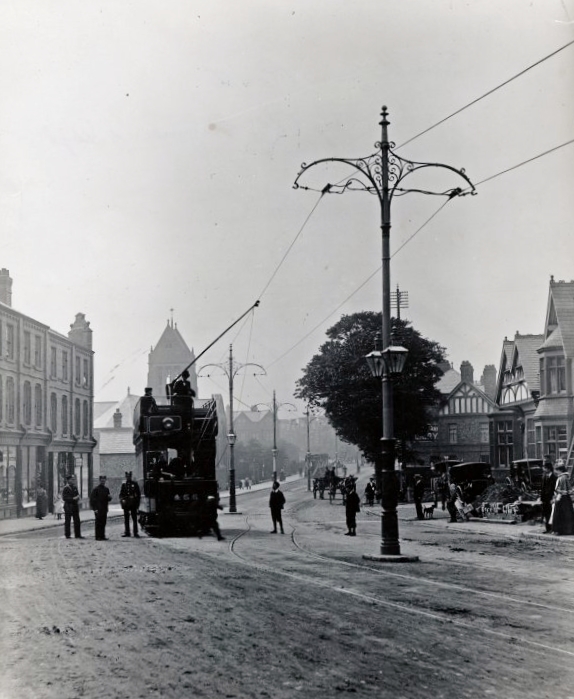 On Smithdown Road, outside the Brookhouse, late 1890s when the trams were new. 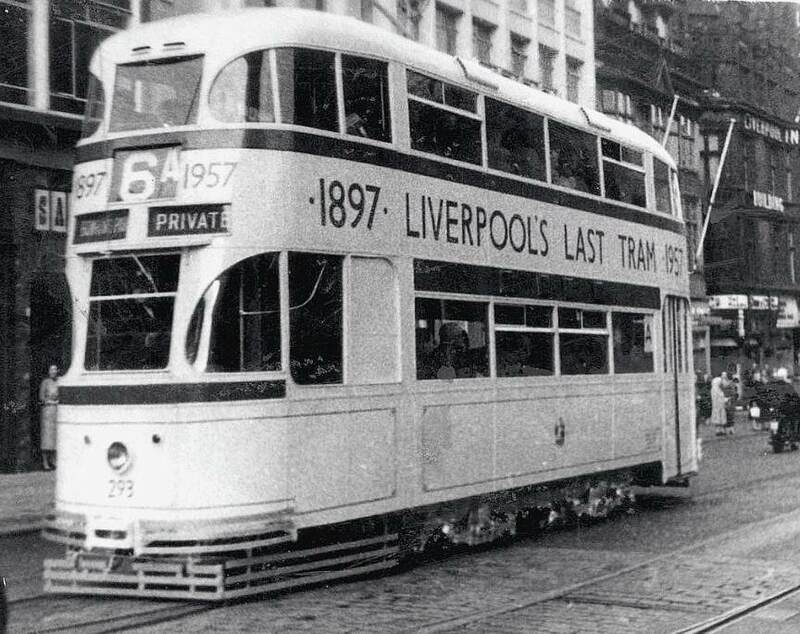 Several of the Liverpool Tram images above are on the wonderful ‘Liverpool Picturebook’ website. Trams boneshakers all sorts of nicknames they had but they ran on time, the drivers and conductors always smart, the conductor turning that great gear round from the end of the tram and reconnecting at the other end with sparks flying. When we had one (a rare happening for many of us) we would leave a penny on the track for the tram to flatten out as it rode over it. I recall coming home after a hard days cycle ride in North Wales. Didn’t fancy climbing Park Road (it was tarmacked by then) but chose Mill Street (still cobbled but no hill to climb) and I aimed for the concrete I thought they had filled in the lines with. What a surprise I got when I realised it was snow and slush in the tramline and off I went across the road just by the old Flatiron pub (now gone). the loss of such an iconic mode of transport.